Matcha seems to be everywhere these days. With tea and lattes, cookies and pastries and even infused ice cream and frozen yogurt, it’s fair to say that matcha is having a moment. What’s with the matcha mania that’s sweeping the country? WHAT IS MATCHA AND HOW IS IT PRODUCED? Matcha is a powder made from finely ground green tea leaves. Though its current ubiquity may suggest otherwise, it’s not mass-produced. The finest matcha is produced in Japan in very small quantities, and the process is a celebration of centuries-old techniques and traditions. The tea bushes are kept under shade cover for a few weeks before they are harvested, which increases their chlorophyll content. This gives the leaves their distinctive, bright-green hue and grassy flavor. The leaves are picked by hand, steamed and air-dried. The stems and veins are removed by hand. Then the leaves are stored for up to a year. Finally, the leaves are ground by granite stones into a fine powder. Green tea is rich in antioxidants, chemicals that can help protect your cells from damage and can contribute to aging and diseases. A few studies have shown that green tea can help lower blood pressure and bad cholesterol. In particular, green tea is high in an antioxidant called epigallocatechin gallate, or EGCG. Additional studies suggest that EGCG may help protect against type 2 diabetes, heart disease and cancer. 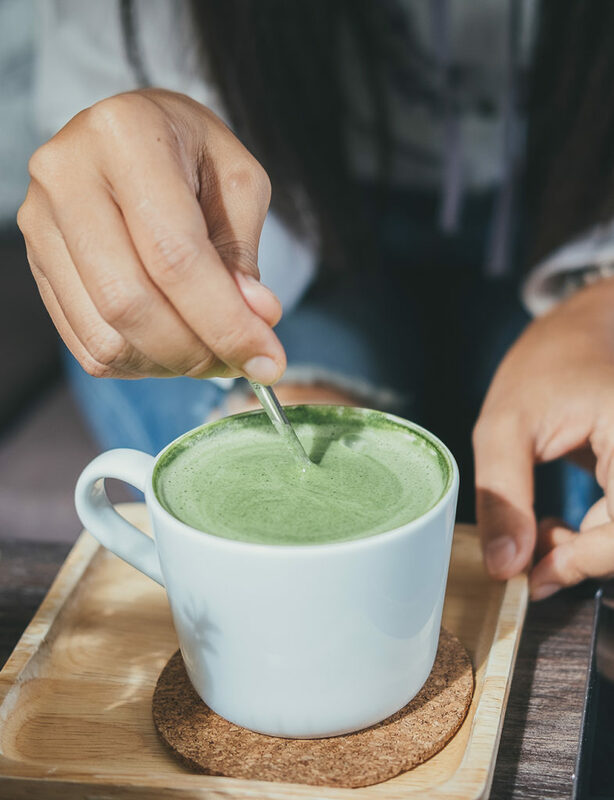 These health benefits are not unique to matcha. They are common to all green tea. But because of the unique way in which it is produced and consumed, matcha is a more concentrated form of green tea. Ordinarily, you strain and discard tea leaves once they’ve imparted their flavor. But with matcha, you end up consuming the leaves themselves, because they are ground into a powder. So you may get a higher concentration of healthy antioxidants. In Japan, matcha has been used in tea ceremonies for centuries. The traditional and ceremonial method of preparing it is simple and elegant—you just mix the powder with hot water, sift a teaspoon or two through a tea strainer into a tea bowl, add hot water and whisk until frothy with a bamboo whisk known as a chasen. Then sip it directly from the tea bowl. These days, you can also enjoy matcha in non-traditional ways. Adding steamed milk to a mix of powder and water yields a latte. Matcha powder can be added to baked goods and ice cream to create flavored desserts. You can even add a scoop of powder to smoothies or sprinkle some over an açai bowl. WHERE CAN I FIND MATCHA? You can buy matcha yourself in specialty tea shops and grocery stores. You can also order it online. Powder comes in grades; ceremonial-grade matcha is the highest quality, perfect for the traditional preparation. It is also the most expensive. Culinary- or cooking-grade matcha, which is less expensive, is perfect for baking and mixing with other ingredients. There are also a number of coffee shops, restaurants and dessert spots that offer matcha-flavored food and drinks. No need to be green with envy. You can give this popular tea a try yourself to see what all the fuss is about. Embrace the ritual, savor the flavor and reap the health benefits. You may find yourself becoming hooked on matcha.